I still remember my daughter and son-in-law’s faces as the ambulance crew came in the room to take Matthew away. The pain and fear in their faces were beyond description. While I was so worried as the grandmother, I cannot begin to imagine what they must have felt. My son-in-law, Rob, is a St. Louis Blues hockey fan. When their first two children came home from the hospital, they were wearing St. Louis Blues shirts. When Rob realized Matthew would not be staying at the same hospital as his mother and would be at a hospital several miles from us all, he brought a hockey puck and asked if he could leave that with Matthew. I thought my heart would break, as I saw him lift the incubator curtain placed over Matthew’s crib to place the hockey puck close by his side. As my husband loves to say, “It’s not over until God says it’s over,” Matthew not only made it through the night, he has grown up to be anything but weak and puny. Standing at over 6′ 7″ tall, he is a giant of a man. Strong and not one to mess with, yet he has a gentle way about him with little kids and his grandma. Because of his kind ways to me, I began thinking of him as a “gentle giant.” That is also the name his mother’s students have given him. He has several times helped his mother with recess and special events for her kindergarten and first grade students. They love this “giant” of a man who is so gentle and kind with them. As a baby, he had beautiful blond curls. When he was two years old, I went running to the car as his parents pulled into our driveway after a drive of several hundred miles to visit us. I opened the door of the car where he was sitting and was shocked to find the blond curls gone. My “little” baby was gone and in his place was a little boy. I cried a little. The “miracle” he experienced when he was 5 or 6. His mother had told him to clean his room. Wanting to play instead, he told her he could not clean the room because he was blind. When Mom responded that he had better clean his room or “else,” he suddenly exclaimed, “It is a miracle! God touched me and I can see!” I laughed until I cried. “Matthew’s School.” When his older brother and sister went off to school, he felt left out. So, I started a school for him in my home. I gave his mother a list of school supplies and assigned homework. We took field trips. When he was old enough to go to school, I cried a little. Last year he had three days of vacation. He took that time (and spent his own money) to fly to Illinois to spend a couple of days with his grandparents. I cried a little. This year he made me a walking stick. I have arthritis in my knees and he wanted to do something to help me out when taking a walk. I cried a little. So thankful that this little baby has grown into a fine young man – even if he makes me cry. 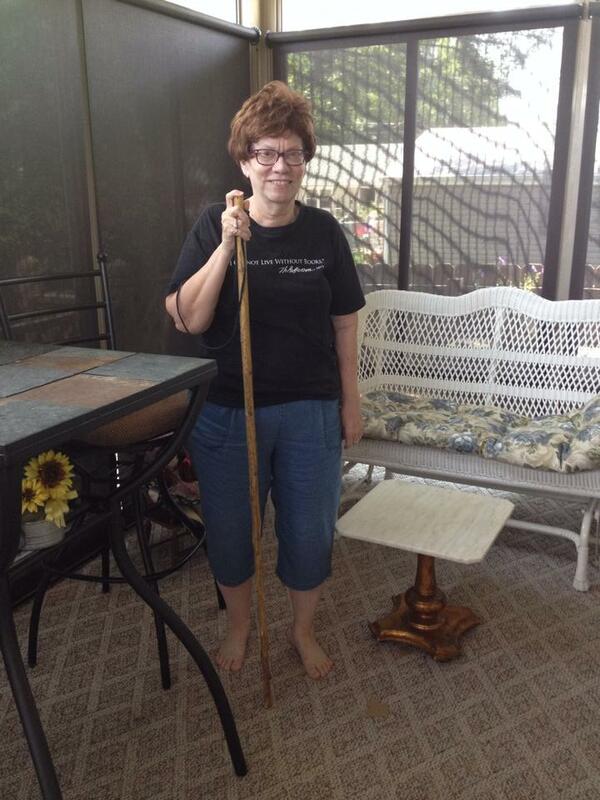 This entry was posted in Family Life, Joys of Grandparenting and tagged Children's Hospital, gentle giant, Grandchildren, Grandparents, Love and Commitment, miracles, walking stick by Barbara Lane. Bookmark the permalink.